Hi, I’m Lisa! I started riding horses when I was nine years old – when my parents realized that my horse obsession was not merely a passing phase. Fast forward nineteen (!) years and here we are! In October 2016, I decided to make a big change and switch from riding hunters to eventing. Follow along, I’m sure to have plenty of (mis)adventures! I started out riding Western and did some showing, 4-H and even a brief spell with barrel racing before switching to English and starting jumping a bit. My mom started riding with me, “to find out what Lisa was getting into,” in her words. My first horse was named Goldie, and we got her when I was about 12 years old. She was an old barrel racer, a dark palomino with a long white mane and tail. Gorgeous! She was calm and steady, and had very smooth gaits, though her canter was fast. Having been a barrel racer in a past life, she was very nimble and could zip around the arena easily. Fast forward a few years, past our second horse, a nut-job named Cash…and I found my heart-horse, Moses. He was a splashy paint and half Thoroughbred, so he had the calm mind with the long legs and engine. The very first weekend I owned him, I took him on an overnight camping trip, and he didn’t bat an eye. 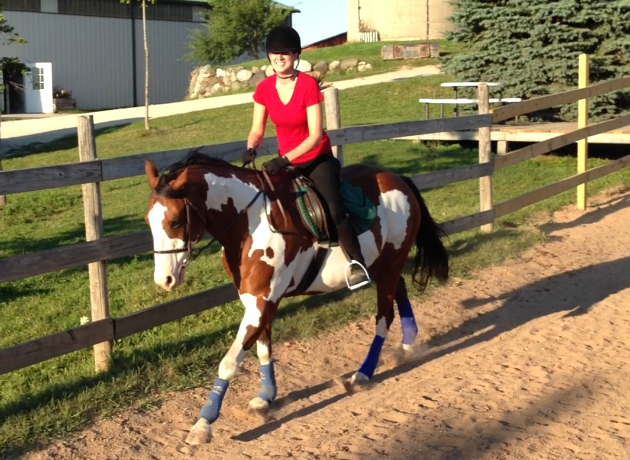 He hadn’t had much training other than walk-trot-canter, so it was a perfect place for us to start together. Over the next three years, we worked together and trained to jump and do some low-level dressage. We did a jumping drill team with some of our good horse friends and covered lots of miles on the trail. We did some cross-country schooling and just horsed around (pun intended). He had such a personality. He was my Big Guy. Just at the time he was ready to start showing, he came up lame. Throughout the summer, his front hooves cracked and kept getting worse and worse until they were essentially being held together with apoxy and strips of copper. After a summer of trying – and failing – to figure out what was wrong, we finally took him to a specialist, who diagnosed him with white line disease. That means that his front hooves were essentially rotting away inside, causing the hoof wall to separate. In very severe instances of white line disease, the coffin bone can rotate inside the hoof. The treatment is to drummel out the infected areas and wait for healthy hoof to regrow. In Moses’ case, he would have lost so much infected hoof that there was danger of his coffin bone rotating anyway as he would have been on stall rest for a year to allow his hooves to grow back. Knowing that he didn’t like being left in his stall when other horses went outside and having seen perfectly calm horses morph into nervous, jumpy ones after extended stall rest, plus taking into account the real possibility that he would have to go through all that and not be healed, I made the very difficult decision to put my Big Guy down. It was at that point that I truly understood the responsibility of being a horse owner. Even though I would have gone to the ends of the earth to heal my horse, I knew that it would have been an incredibly difficult process with a very real chance that it would all be for nothing. And I understood that I could not put him through the pain, extended stall rest and difficult healing process, because he would have been miserable. So, on October 31, 2008, I took my guy on a last ride and said goodbye. I was devastated. And for the next 3 1/2 years, I stopped riding. I had no desire to go back out to the barn where I’d ridden growing up, and since I was in college it was easy enough to focus on school, instead. After graduating, I ended up moving to a new city and starting a new job. Finally, in summer 2012, I found a barn in my new city and started taking lessons. In a serendipitous twist, I began riding a horse named Husky, who looked a lot like Moses. There are differences, of course, but it was kind of wonderful to be riding another splashy, beautiful paint. It was the perfect way for me to reenter the horse world. We even showed together and won some ribbons! Since Husky, I got to ride a number of different horses that have helped me grow as a horsewoman, including perhaps the one who made the biggest impact: a youngster named Drifter. He was a grullo Foundation Quarter Horse with a forelock like Fabio and a tendency to put in the smallest amount of effort he thinks he can get away with. I rode him from age 4 to 6, and brought him successfully through his first season as a hunter before he was sold by his owners. And that’s how I ended up here: A hunter rider with an unconventional background, switching to eventing as a horseless adult amateur. The road has not been without bumps, but – as any rider knows – when you fall off, you get right back on. And over the years I have learned that if you stay centered, things tend to fall into place. Putting them down is the hardest thing to face in the horse world. I am so glad you are back in the saddle. Bravo. Definitely! It has been so wonderful getting back into horses. And I can’t wait to start my own search for a spoiled equine! 🙂 Good luck on your search! That’s awesome! Welcome to the wonderful world of English riding! Lisa, I’ve been reading your blog for some time now, and keep coming back to find out what you’re up to. It will be fun to follow along on your new Eventing journey! Thank you, Elinor! I’ve been following yours, too and love following along with your updates, as well!